- Izrada crteža oplata i armature inženjerskih objekata u infrastrukturnim projektima (potporne konstrukcije, tuneli, mostovi, hidrotehnički objekti i td.) i objektima visokogradnje. - Osnovni nivo engleskog jezika. Meanwhile, if you have any question, please contact us by email office@cestra.rs or telephone (+381) 11 38 35 040. Preliminary Design with Feasibility Study of reconstruction and modernization of existing railway track and construction of a second track on the line Belgrade-Nis, section Stalać-Đunis. This project is part of overall effort aimed to the completion, modernization and sustainable development of the Serbian core railway transport system within the Corridors X, in order to meet the required EU capacity levels and quality standards. The goal of project is to upgrade the existing single rail track line on the section Stalać-Djunis to double track, satisfying TSI requirements. Renewing the existing line requires alignment adjustments that will enable speeds up to 160 km/h instead of current 60-80 km/h, while providing UIC-C profile clearances. 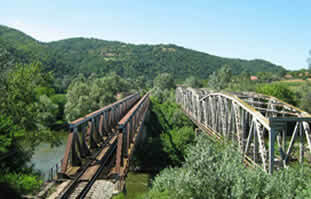 - The only single-track section on the railway line between Belgrade and Niš. - The allowed axel load on the existing Stalać-Đunis Section is 22.5t, with maximum speeds of 65 km/h on Stalać-Braljina Section and 85 km/h on Braljina-Đunis sub-section.